As temperatures have risen in Littleton, we’ve seen more and more customers coming in with failing batteries. One common culprit: Corrosion. 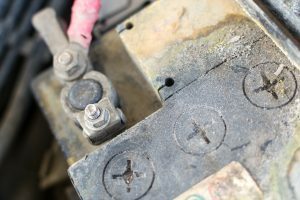 Corrosion on your car battery can reflect normal wear and tear on your vehicle as the battery ages, but it can become worse with high temperatures in the summer months. While it can be okay to see a small amount of corrosion at the terminal, large buildups can signal a problem. Small leaks or loose connections to lead to corrosion. If you notice a crack in the battery or acid leaking on the outside, you might have a serious problem. When you notice this, bring your vehicle in to our shop right away for an inspection and to replace the battery. As corrosion occurs, you’ll start to see white, green, or blue material building up on the terminals. Small amounts may be harmless, but if the build-up continues to grow it can interfere with moving the charge from the battery to the engine. If the problem persists, your vehicle’s on-board computer may show issues or fail to operate. The on-board computer receives important information from the many sensors in your vehicle to keep it running, alert to potential issues, and keep you safe. Ignoring issues may put you at risk. If you notice corrosion, bring your vehicle into our shop – our ASE-certified technicians will remove the corrosion and thoroughly inspect the battery and all other related components. Corrosion could be a sign of a more serious problem. Don’t ignore the warning – schedule an appointment or drop in anytime to have your battery tested, inspected, and identify problems early to avoid hassle and expensive repairs down the road!